Arizona Criminal Defense Attorney, Aaron Black has devoted his career to defending people accused of serious criminal offenses. From a DUI to domestic violence, criminal damage, manslaughter and virtually every other criminal offense. Aaron focuses on the fact that we all have Constitutional Rights and he is proud that he can protect his clients' Rights while in the court system. 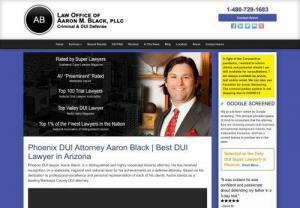 Call Aaron Black for a free legal consultation at 480-729-1683.